On Second Scoop: Ice Cream Reviews: Oh the memories!! Look at the picture my wife found! Remember how I said me and my wife always use to buy two containers of ice cream back in college? Well, here's the proof! It's one of those things that you remember, but it's always so much funnier to see. I'm not sure which one of us took this picture, but I'll assume it was me for whatever reason. Man, I wish this photo had an exact date (but more on that later). 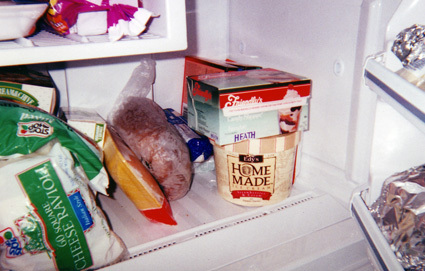 I'm guessing I picked the Friendly's Heath flavored Candy Shoppe Ice Cream and my wife picked the short lived Edy's Strawberry & Cream Home Made ice cream, though it could totally be the other way around. Ofcourse we shared, and I think I remember them both being pretty darn good. We had fun budget shopping back in those days. We fed both of us half decent food for less than the price of one school meal plan. Other tid bits of history? Notice the slab of cookie dough to the left (and some Barber Foods chicken cordon bleus in the back, we ate those things all the time!). Now for some background. 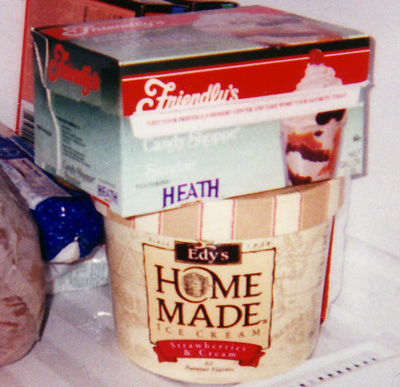 According to an article I just dug up, it looks like Edy's home made was announced in January of 1998. It started with six flavors: Vanilla, Strawberries and Cream, Butter Pecan, Chocolate Chip, Double Chocolate Chunk, and Banana Cream Pie. I'm not sure if it says "all natural flavors" or "all natural ingredients", but it's products like these that make me wonder how Edy's got to the gummy fun flavors they serve up today. Maybe I'm just picky, but I don't think Edy's tries nearly as hard as it use to. Ha, looky here! 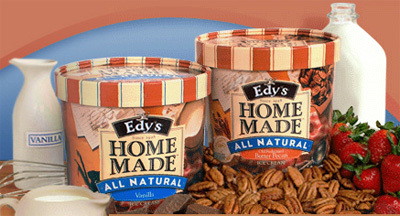 I found a All Natural Home Made page buried on the Edy's site! Now you can't get to this page from the main page, so this just re-enforces the notion that this is a retired product. It doesn't help that the only flavor listed is Vanilla (though Butter Pecan is shown in the photo). Those also look like full size containers which haven't been around for awhile. Oh well. As far as Friendly's candy shoppe flavors go, well, I don't think they made the transition from box carton to the newer style carton. It's a shame because I think there was a flavor for each of their sundaes, at least the more popular ones. Friendly's does still carry "Sundae XTremes" now, but it's not the same really. You know, it's crazy to think how much ice cream has changed in just a decade. Oh me oh my, thanks for walking down memory lane with me. If you've got any good memories, be sure to leave a comment! Freshman year was all about Brigham's, but Sophomore year was when I discovered Mr. Ben and Mr. Jerry. I wanna say peanut butter cup was my first flavor! Behind every chocolate, it tells a story of sweetness. And sometimes, stories about bitterness.